Tokina are adding a new wide-angle zoom to its newly-launched range of high-resolution lenses for full-frame DSLRs. The 16-28mm f/2.8 FF will be the second lens in Tokina's new Opera range. Shown behind glass at Photokina 2018, the full-frame zoom has the same focal length and maximum aperture as the Tokina 16-28mm f/2.8 AT-X PRO FX which was launched back in 2010. The autofocus lens will be manufactured in both Nikon F and Canon EF lens fittings. The Opera range was launched with the introduction of the 50mm f/1.4, which is about to go on sale. The lenses are designed as premium optics that will help maximise the resolution of 50-megapixel full-frame DSLRs – such as the Nikon D850 or Canon EOS 5DS. 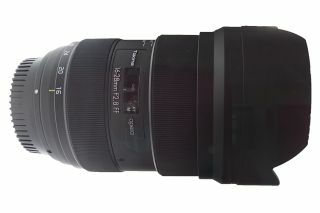 The Tokina Opera 16-28mm f/2.8 is not expected to reach the shops until March or April next year. Tokina Opera 16-28mm f/2.8 (centre) with the Opera 50mm f/1.4 (right) and the Firin 100mm Macro.